Brett Bros Fungo Bat is constructed of Maple Wood and is ultra light weight and durable. It is the perfect bat for any coach to conduct infield/outfield practice. 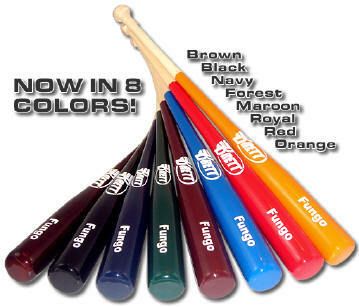 Brett Bros. Fungos are available in 8 different colors. Brett bats with "Bamboo Super Core Technology". PowerWood Technology goes into every bat we make. But what goes into PowerWood Technology? High- tolerance joinery, ivory hickory and sapele hardwoods, plus a special laminating process, to name a few. All combine to create a bat that will never shatter or splinter - something other all-wood bats can't do. We stay true to the Baseball Tradition. Made in USA comes with a limited one-year warranty & 4 month breakage warranty. Manufactured as an extremely lightweight fungo for coaches and trainers for hitting fly balls, pop-ups, and grounders. The Fungo Blaster Baum®Bat is up to 36" long and weighs only 22-24 ounces, with a standard barrel size that has not been trimmed down like other fungo bats. Our most popular and universal Fungo. Features a tapered knob, .93" handle and 2.42" barrel with a long taper. A great tool for both ground balls and fly balls. This is more of an infield Fungo but can be used to hit fly balls as well. The ideal Fungo for those of you who like a shorter Fungo that is easy to handle. Features a tapered knob, .93" handle and 2.42" barrel with a long taper. A fungo bat is a specially designed bat used by baseball coaches for practice. The bat is designed to hit balls tossed up in the air by the batter, not a pitched ball. Typical fungo bats are 34 to 36inches long and weigh 20 to 27 ounces. Coaches hit balls during fielding practice, and the weight and length allow the coach to hit balls repeatedly with high accuracy. The small diameter also allows coaches to easily hit pop-ups to catchers and infielders along with ground balls due to better bat control of the barrel of the bat. Choose a bat for your needs. Fungo bats are lighter than regular baseball bats and come in may wood varieties. The idea is to find a bat that you can swing repeatedly without getting tired. Place your bat on your back shoulder and toss the baseball up with your front hand. Opposite if your a left handed hitter. Toss the ball high and far enough away from the body so you don't get jammed. Grab the handle with your free hand bringing the bat back a few inches. Try and hit hit fly balls to fielders at shoulder level, grounders to infielders at chest level and line drives at waist level. See the baseball as being divided horizontally. During practice, hit at the lower half whenever you want to add some height to your fly balls. Conversely, hit at the top of the baseball when hitting ground balls. Let the bat do all of the work and relax when hitting. As a coach, you know how tension can negatively influence performance. To be consistent, your swing should be relaxed, confident and with out of tension. Practice to perfect your swing. Hit each ball with the purpose of having the fielder make the catch and visualize where you would like it to go. During practice set up a station along one of the outer most baselines and hit fly balls to your pitchers and outfielders for extra work. The more you use a fungo bat, the better your fungo hits will be. Fungo bats are often used during practice to hit pop-ups to outfielders or grounders to infielders. Fungo bats were not created to hit pitched balls but rather balls thrown into the air by the batter. The bat is lighter and has a longer neck than a normal baseball bat, and the smaller diameter allows for greater accuracy with hit balls. There are multiple theories surrounding the origin of the word "fungo": some believe it's slang for "fun" and "go," a part of a sand lot game in which a player catching three fly balls would replace the batter. The first recorded use, according to The New Dickson Baseball Dictionary, came between the late 1880s..
Every major manufacturer of regular baseball bats also produces fungo bats. We have chosen Brett Brothers for price, Baum or MacDougall for quality and performance, and Sandlot Stiks for custom production. Our fungo bats are made from hickory, maple, ash, and a high tech composite wood materials. Fungo bats are made for all levels, youth leagues, high school, college, and for the pros, and come in a variety of sizes. Coaches should choose a bat that's light enough to continuously hit balls to players without becoming tired. The cost of fungo bats ranges from $45 to $177, depending on the material used to make the bat. Remember it's not the cost, color or material that makes a great fungo hitter its the time spent in practice. 1. To teach a catcher how to properly field pop flies, have a coach should stand inside second base or in foul territory and hit balls into the air. 2. A coach, standing at the side of the pitcher's mound or near home plate, hits flies to outfielders. 3. A coach simulates a throw from an outfielder to home plate by hitting a ball from the outfield area to the catcher at home. 4. A coach stands at near of behind home plate while there is a runner on first. The coach then hits to the shortstop, who then throws the ball to the second baseman, who in turn throws it to the first baseman. Then repeats the ground ball to the second baseman to reverse the double play practice. Always practice the a double-play more than the single out as this one is your defensive straightly and gets a pitcher out of bad situations. 5. From the infield hit fly balls to the warning track or near the outfield fence so that outfielders will know where they are when going back on deep flies or balls hit over their head in a game.